It is difficult and even impossible to protect oneself from something you can neither see nor smell. That is where EMF Meters come in. They help people identify invisible EMF radiation waves. It is especially crucial when the people in question are sensitive to these waves (Source). Moreover, high levels of EMF radiation interfere with wireless communication. That means professionals also need meters to handle interference. Different meters are available in the market, each with a specific purpose. Hi-tech meters are for professionals who understand the EMF spectrum in addition to requiring exact readings. Others are designed for simple use in the home or office environment. Either way, here is a list of the best EMF meters in the market. 8.0.1 What is an Electromagnetic Field? 8.0.3 How Can I Tell If I am Affected with EMF Radiations? The TriField TF2 has two things going for it that make it a top pick—It is accurate and easy to use. 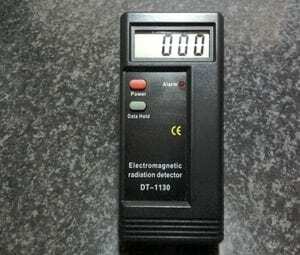 The TF2 is highly reliable because it measures all the three major types of electromagnetic radiation—Electric, Magnetic and Radio Frequency/Microwave radiation. Also, when at its Magnetic setting, the meter uses a three-axis sensor. That means you can point it in any direction, and it will still pick up the radiation. It is easy to use thanks to the LCD. The display is also backlit which means that in low-light settings, you will still read the results. As significant plus of using the TF2 is that in addition to the display it has an audio output. The audio output helps a great deal in locating the source of radiation. It is essential to note that the meter has two modes—standard and weighted. The standard mode will detect the regular AC measurements. However, the weighted mode has a unique frequency to help identify EMF radiation inside the human body. Laptop, Desktop, TV, and Home Appliance Radiation in Refrigerators, Washing Machines and so on. The unit has an easy to understand display. The TF2 provides value for money. It has a high-quality construction which in turn makes it durable. It has an audio indicator for further clarity and functionality. The unit is user-friendly thanks to the ease of use. The weighted Mode is too complicated for a home user. However, it is perfect for professionals. The audio and backlight buttons can only be accessed by removing the battery cover. This is a bit inconveniencing. As the name indicates, the Acoustimeter RF Meter only detects radio frequency radiation. It does not detect magnetic field or electric field radiation. However, thanks to this specialization, professionals rate it as the best meter in the market for the detection of RF radiation. The AM-10 is highly sensitive. It can read small amounts of low radio frequencies and display the results. It has an incredible directional sensitivity as well. If you want to determine the source direction of the largest or lowest RF radiation, then all you have to do is move the AM-10 in a circle and note the peak and minimum readings. The sensitivity makes the AM-10 highly effective. The frequency range of the Acoustimeter AM-10 is quite impressive. While the TF2 discussed above can read up to 6Ghz, the AM-10 goes all the way up to 8Ghz. As a result, it allows you to measure a broader range. Finally, one cannot fail to note how effortless it is to use the Acoustimeter AM-10. The unit has a display that is easy to read and two rows of LED lights. The reading on display corresponds to the LED lights. The audio output augments the display and helps find radioactive signals faster. Bear in mind that you must first learn how to read the display. Usually, the display will show three readings—the highest reading since turning the Acoustimeter on, the current peak strength and the average reading per square meter. The unit can detect electromagnetic radiation from cell phone towers, cell phones, WiFi, Bluetooth, Wireless Communications, TV and FM radio towers, microwave leakage and pretty much any other source of Radio Frequency sources. For this reason, the unit is versatile. The Acoustimeter is of high quality. The unit is sturdy enough that you can use for a long time. The unit is highly accurate regarding RF radiation. The Acoustimeter is easy to master and in turn use. The unit limits you to RF radiation. 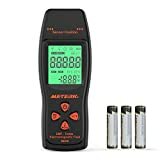 If you compare the Meterk EMF meter to the others discussed, then you will note that its price is far below the others. That does not mean the device is not as good. Actually, it is rated highly, and it has numerous good reviews. However, it is important to realize that the device does not have as many features as the others. The features it lacks will be noted below, but it is essential first to discuss the things that make this particular unit good. For one, the Meterk is easy on the pocket without compromising on functionality. This is because the device is manufactured in China where they can produce the detector at a low cost. Second, the meter measures both the magnetic fields and electronic fields. This ability makes the unit effective because the two frequency ranges ensure the Meterk can measure just about any EMF radiation in your environment. 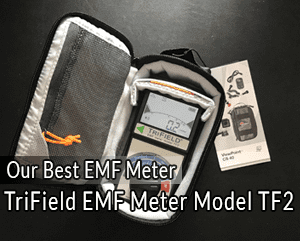 Finally, because the device has a display that utilizes the common EMF units of measurements, it is easy to use and can be quite ideal for beginners. In terms of accuracy, the Meterk is comparable to the other EMF meters discussed which means it is highly accurate. The Meterk has four buttons. The power button switches on the device after a long press, and it disables the sound after a short press. The mG/uT button allows you to set the values you want the Meterk to beep at, and to select the units you prefer between the Milli Gauss and the Micro Tesla. The mG/uT button, therefore, facilitates convenience. The Mode button allows you to turn the backlight on and off for a brighter display. On short press, the mode button will freeze the current reading on the screen which will give you time to record it if you so wish. The final button is the temperature button that allows you to switch between oC and oF depending on preference. The unit lacks an RF reading, a tri-axis capability, and high-quality material. Because of the lack of tri-axis capability, you cannot get an accurate reading when the unit is on a random orientation. The sensor must be located on the right-hand side and pointed towards the source of the radiation. It is small and light hence easily portable. It does not read RF radiation. An upside to this is that it can be a perfect complement to the Acoustimeter discussed above. The quality of the Meterk, in terms of material used, is not as high as that of Trifield or Cornet. Because a reputable brand manufactures it, the Cornet is quite popular. Also, it has numerous functionalities. For one, it is highly effective because it can measure all EMF radiation—Radio frequency radiation, electric field, and magnetic field. Second, unlike most meters, the Cornet will give you an actual frequency reading. That means it will not provide the reading of the RF radiation in terms of signal strength. Instead, it will provide an actual reading of between 100Mhz to 2.7Ghz which is helpful and more accurate. The Cornet is highly sensitive, which in turn facilitates accuracy. It is especially so when it comes to RF radiation. 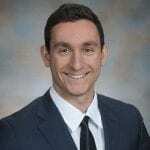 Industry experts note that only the Acoustimeter can be considered better in terms of RF radiation detection. Its range is actually similar to that of the Acoustimeter—100Mhz to 8ghz. Similar to most meters, the Cornet has an audio output which makes it easier to detect the source of the radiation. The reading history is the final and arguably most exciting feature the device has to offer. Essentially, the Cornet displays the last 30 readings. That means you can go back and note the spikes after scanning a room. It is extremely helpful for things that tend to pulsate and hence give varying readings. The device uses a 9V Alkaline battery although it can also be powered externally via a USB port. The Cornet is versatile because it measures everything. The Cornet is reasonably priced and gives value for money. The Cornet is highly accurate. The device is durable and of high quality. The primary reading unit is Tesla, and one cannot change this to milliGauss. User-friendliness is lacking thanks to the few buttons and lack of clear directions on how to use them. 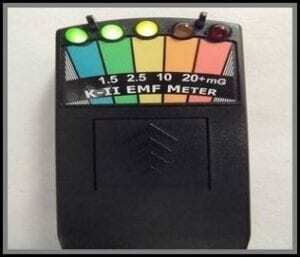 While EMF meters are primarily used to detect harmful EMF radiation, this particular unit can also be used by Ghost hunting enthusiasts. It is popular with paranormal investigations because of its accuracy and reliability. It measures magnetic and electric electromagnetic radiation. Note that it does not measure RF radiation. However, it is highly accurate when it comes to electric and magnetic radiation thanks to the 50-20,000Hz frequency. The device is light and small (pocket-sized). As a result, it is highly portable. It has an easy to use LCD and sound alerts that allow you to take note of the frequencies easily. The LEDs help improve the accuracy, and the toggle on/off button facilitates convenience. It has an instant response rate. It has an easy to read LED scale. The unit can be used for both general and paranormal radiation measurement. It is a single axis device. EMF detectors vary significantly in price. Some cost $50 and below while others cost $300 and above. Due to this variation, it essential that you weigh the cost against the functionality or features. The lowly priced ones might not have all the features that you need while highly priced ones might be specialized meaning they read only one type of electromagnetic radiation. It is advisable to go for a detector that will give you maximum functionality but at a reasonable price. When thinking about the intended uses, the two major things to consider are whether the device is tri-axis or single-axis. A tri-axis meter is a bit expensive, but it offers a three-dimensional approach to measurement. That means it is perfect for professional use. A single axis device is limited as it can only measure when oriented in a particular axis. It is less costly but not as accurate. Consequently, it is perfect for home use where absolute results are not necessary. In terms of convenience, it is a matter of determining whether the unit offers additional features that increase user convenience. Such features include an on/off button, portability, a manual, low battery indication and so on. It is important to go through the specifications and determine all the unique features available. Always go for the unit that offers more user convenience. For any device, the better the specifications, the higher the functionality. With regards to an EMF detector, specs are even more crucial because they determine accuracy. Here are some typical specifications you can consider when purchasing an EMF meter. The availability or absence of audio alarms. Regarding range, for instance, you can pick a detector with a higher range. When it comes to a power source, consider one with a long-lasting power source. Always go a unit whose specifications offer a better user experience. Essentially, you cannot go wrong with the EMF Meters discussed above. However, here are three frequently asked questions. EMF or Electromagnetic fields are low-frequency radiations emitted by anything electric or electronic. Initially, thanks to non-ionizing, they weren’t considered harmful. However, in recent times Electromagnetic fields have been linked to headaches, anxiety, depression, sleep disturbances, blood pressure and so on. How Can I Tell If I am Affected with EMF Radiations? It is difficult because one can neither smell nor see such radiation particles. Not every headache or sleep disturbance is as a result of EMF radiation. That is where EMF Meters come in handy.